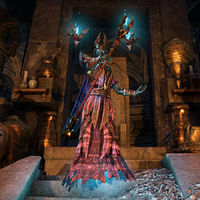 Magnifico Bahraha is a lich found in Bahraha's Gloom. In life he was a Yokudan necromancer and the uncle of Prince Hew. He will initially be found resting on a throne in the final chamber of the delve, and cannot be interacted with. You will need to kill the First in order to awaken him. Once he arises from his throne, he will shout at you. Magnifico Bahraha: "Nothing leaves this place alive!" Magnifico Bahraha: "Ah, fresh life energy for the taking!" This page was last modified on 11 February 2019, at 05:01.